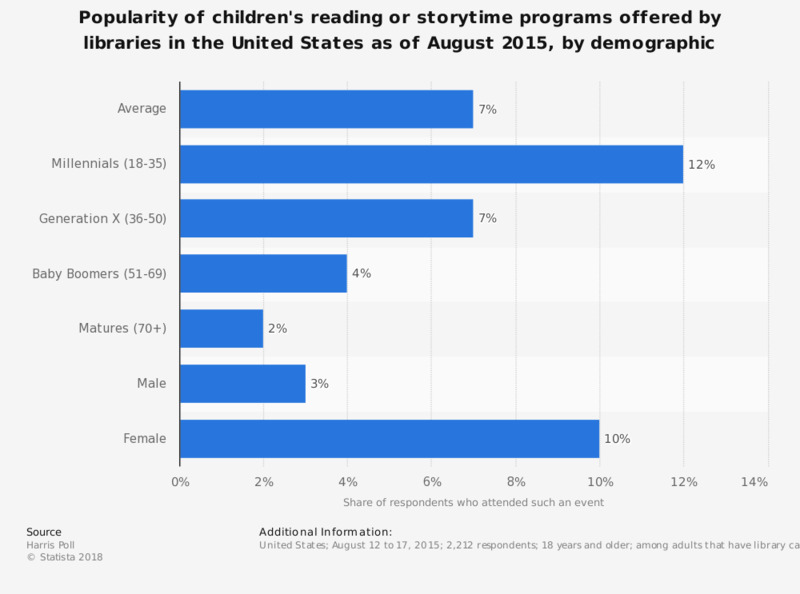 This statistic presents information on the popularity of children's reading or storytime programs offered by libraries in the United States as of August 2015. It was found that 10 percent of female library card holders attended such events. Multiple responses were allowed during the survey. Statistics on "Libraries in the U.S."
Overall, thinking of your public library, based on what you know or have heard or read, how satisfied are you with your public library? About how many times during the past year have you visited or used the public library or public library services? Thinking back over the last year, which three of the following were the top things you used the library for? As you think about your library, how important are the following statements for how you view your local library? When you read books, what is your preferred genre? Where, if anywhere, should books with themes related to witchcraft, wizardry, and magic be banned?